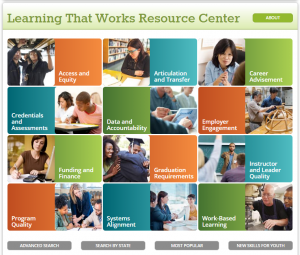 Earlier this week Advance CTE launched the Learning that Works Resource Center, a repository of high-quality Career Technical Education (CTE) and career readiness research and promising policies. The Resource Center is supported byÂ JPMorgan Chase & Coâ€™s New Skills for Youth initiative, a partnership of Advance CTE, the Council of Chief State School Officers and Education Strategy Group, and is designed to connect state leaders, policymakers, academics and practitioners alike with a vetted bank of resources from which to learn and expand their knowledge of CTE. The home page features 12 different categories of resources related to CTE. Hover your mouse over a topic tile to see a description of the types of resources included in that category. Once youâ€™ve settled on a topic to explore, click on the tile to enter the Resource Center and view a list of resources. The most relevant documents will be listed at the top, but you can filter even further by using the â€œBy Stateâ€ and â€œBy Resource Typeâ€ filters at top of the page. Note that the icon next to the resource indicates the resource type: Guide/Tool, Policy or Report/Case Study. Click on any resource title to read a summary and download the full version of the resource. Related resources are located at the bottom of each resource page, but you can always explore another topic by clicking on the menu to the left. The Resource Center includes advanced search options to help you find exactly what youâ€™re looking for. Start by clicking the â€œAdvanced Searchâ€ button at the bottom of the home page to access additional search filters. From here you can search by title, keyword, primary topic, resource type and/or state. Be aware: while this feature allows you to hone in on specific resources, including additional filters limits the search response. You may end up seeing only one or two results. The â€œSearch by Stateâ€ and â€œNew Skills for Youthâ€ buttons on the bottom of the home page also allow for further filtering. â€œSearch by Stateâ€ allows you to identify all resources related to a specific state, which may come in handy if you want to learn more about a program or policy in that state. â€œNew Skills for Youthâ€ includes tools and resources specific to the JPMorgan Chase New Skills for Youth initiative. Good news – youâ€™ve come to the right place! The Resource Center has all the information you need to become an expert on CTE. If you want to get a broad sense of what other people in the field are reading, click on the â€œMost Popularâ€ button at the bottom of the home page to view a list of the most frequently visited pages. Otherwise, you may want to start by exploring the 12 topics and narrow down your search from there.